Below is a recap of my 3rd half marathon. 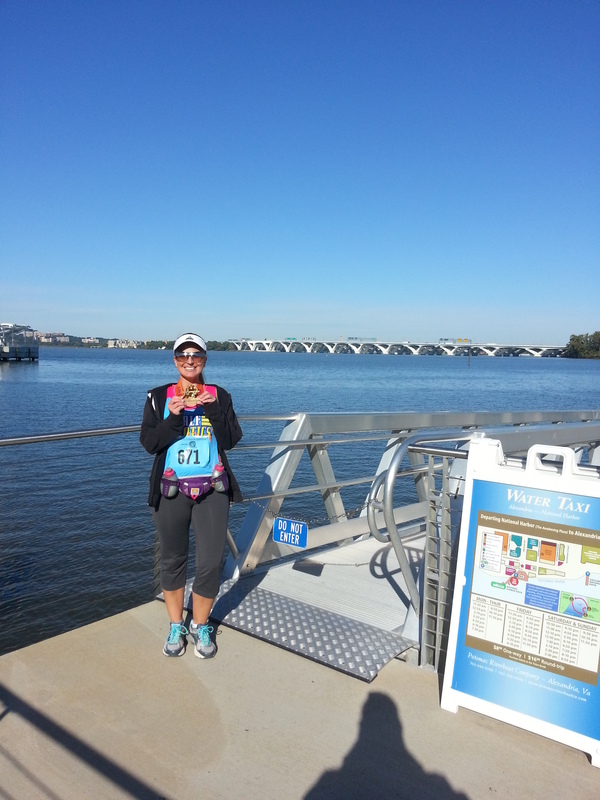 The Woodrow Wilson Bridge Half Marathon. I choose this race for a couple of reasons. A) I thought it would be cool to start a race in Virginia, run through DC (the bridge), and then end in Maryland. B) The Woodrow Wilson Bridge holds special meaning to me. As a kid, being on the bridge (the old one) meant I was on the way to one of my favorite places; Grandma & Granddad’s house! Unfortunately, nobody was able to run this one with me, so this was my first race that I completed without knowing any other runners. EXPO – I decided to attend the WWHM expo on Friday evening. Gabby and I drove to the U.S. Patent and Trade Office in Alexandria. The drive wasn’t bad and only took us a little over an hour. The line to pick up my bib was pretty lengthy, but moved really fast. I got my bib (671) and then we were ready to walk around the expo. The expo was not very big, which I expected since this is a smaller race. I was kind of hoping it was a little bigger so that Gabby could get a real taste of what races are like. No biggie though. I got a new 13.1 magnet for my van since I lost my Frederick magnet and we were on our way home. We settled into our room around 8:00 or so Saturday night. I laid everything out for the next morning. It was at this point that I realized I forgot my nice camera that I wanted Steven to use for the finish line. Oops. I lay down around 9:30 and was actually REALLY tired. At this point, I thought I was genius for getting up early that morning to ensure I’d be extra tired that night. I set my alarm for 4:20 and went to lala land relatively easily. Until about 11:30 when I woke up to the sound of a car alarm. UGHHH. What a horrible noise. So, I think it will go off soon…only it doesn’t. The alarm continues to go off. It would go off for 10-15 minutes and then stop for 10-15 minutes and start again (overly sensitive alarm that went off due to traffic and wind, I assume). Steven went to the desk to complain and they said they would call the police. They told him that sometimes people park their cars there to go out for the night. THE ALARM DIDN’T STOP!! I went to the front desk at 1:40 to complain again. They said the police had come and the owner was not a registered guest so there was nothing they could do. They offered to move me, but I knew that was pointless since other guests on the 3rd floor were also complaining. I was basically dismissed because they were dealing with “another bigger problem with an elderly lady”. The alarm finally stopped (I like to think that it was the result of my talk with the front desk staff, however in all honestly, I think the car battery finally died). So at that point I was wide awake and could not go back to sleep. Steven was irritated too but he was finally able to fall asleep. And because my night just kept getting better and better, he began snoring heavily (he is not typically a snorer…just occasional). I had to *gently* shove him a couple of times :O) I would estimate that I finally went back to sleep around 3:00 or 3:30, but it was such a blur that I really don’t know what time it was. 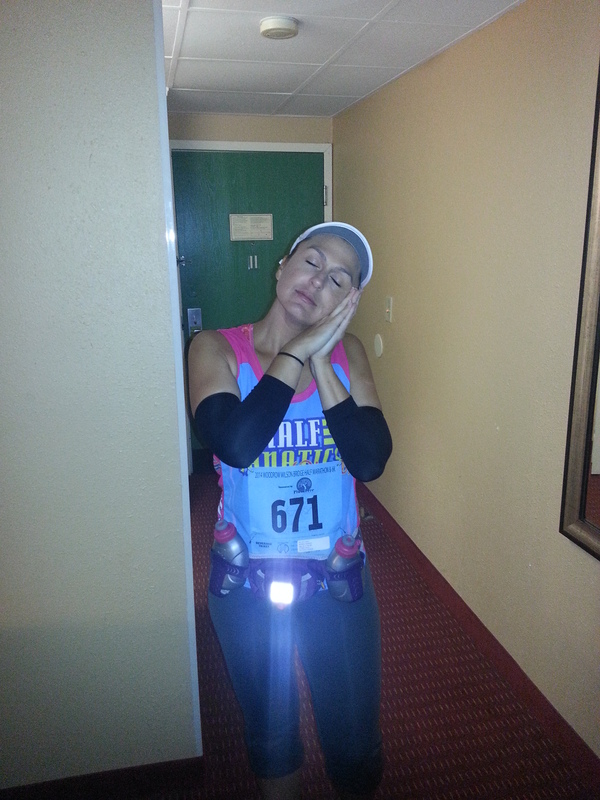 RACE DAY – My alarm went off at 4:20 and surprisingly, I got up right away. I got myself ready and then toasted half of a bagel (with peanut butter and honey on top). Unfortunately, I couldn’t get it down. I took one bite and knew it wasn’t going to happen (I’ve been struggling with this for the past several weeks even though it was my go-to pre-race food in the spring). So I woke Steven up and finished preparing all my stuff. I packed a bag of nuts and chocolate soy beans (Planters NUTrition packs…they are pretty good) and a banana in a bag to eat on the way. We were finally out the door and on our way to the National Harbor. This race was a point to point race so we had to drive to the National Harbor so I could catch a bus to Mount Vernon (the start line). The 1.5 mile ride took some time due to traffic, but all in all, it really wasn’t too bad. We were parked by about 5:20 or so and decided to hang out there in the van for a bit. The temp outside was just over 40 degrees. Perfect for running, but not ideal for standing around (even with my “arm warmers” that I fashioned out of a pair of trouser socks by cutting the toes off). I knew the last bus was supposed to leave at 5:45, so we had time. I ate my bag of nuts and drank some water. Then I decided to go get in line for a bus. Steven walked me to the bus line, gave me a quick kiss, and I was off! The buses were nice (comfortable and heated). 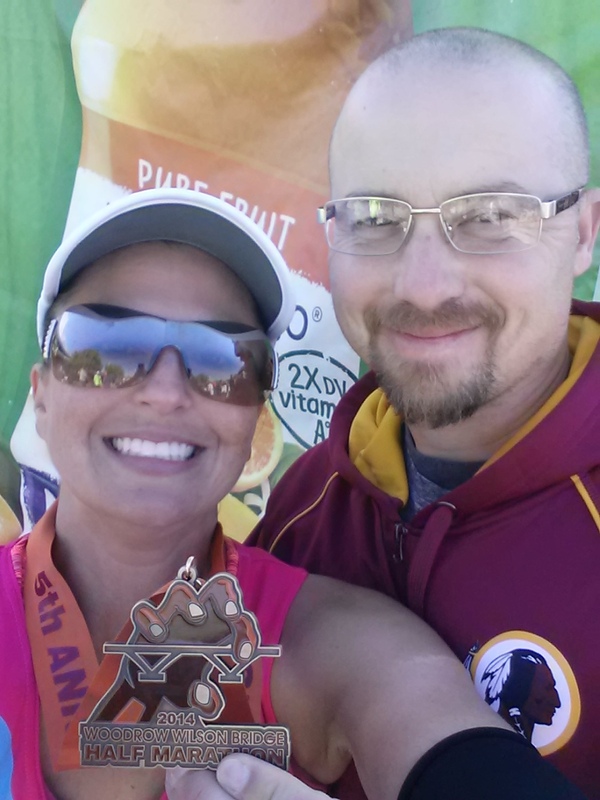 I chatted with a nice woman (Celeste) who lives near the Harbor and is going to be a runners coach (new and advanced) for some events in and around DC next year. I remembered seeing her brochure in my packet and now I wish I would have kept it. I thought I did but when I got home on Sunday, I realized I had tossed it already, thinking I would never drive to DC for training runs. Anyway, our chat helped to calm my nerves and it made the bus ride enjoyable. We finally arrived at Mount Vernon (probably around 6:00). It was very dark outside still, but we were advised where the bag drop off and port-a-potties were. First order of business…get in line for the port-a-potties!! 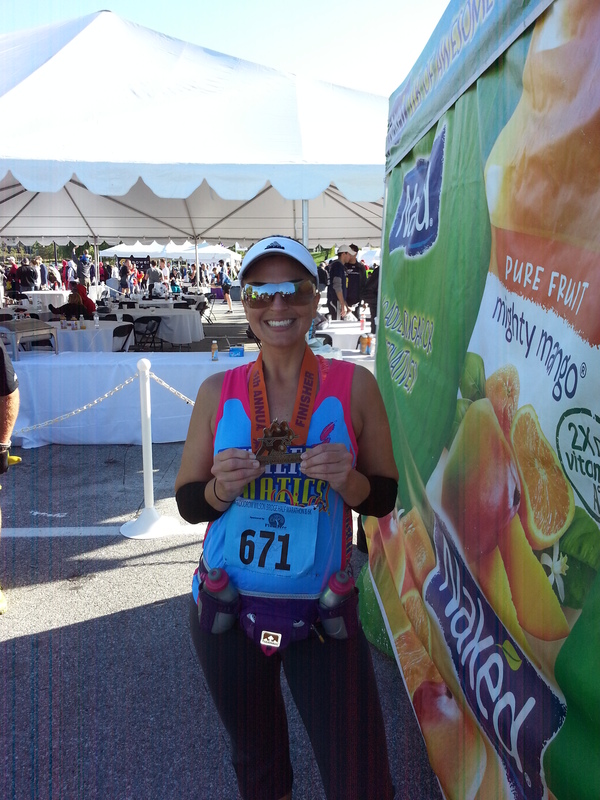 I could not believe my eyes when I saw there were only about a dozen or so port-a-potties for over 2,000 runners. The lines were very long and unorganized. It was hard to tell where exactly the lines ended. Runners who had completed this race before seemed surprised and indicated that this was not a problem in the past. I got in a line and ate my banana and waited, and waited, and waited. I obviously picked the wrong line (special talent of mine) because we were going NOWHERE! At 6:45, I ate my sports beans. At 6:50, I was panicking. I still had a LONG way to go. I saw everyone headed for the woods and decided to join in. Iye yie yie! This is a big deal for me because I have never been one to be able to pee in public, but my bladder was stretched to its limits and I did what I had to do. My goodness…there were SOOO many bare butts in the woods that morning. I bet that was a pretty site (Sorry I don’t have any photos)! I am glad I did though because I instantly felt better. I ran to the bag check real fast and took my jacket off (BRRRRRR!!!!!) and checked it. I made it to the start line just in time for the start of the race for the visually impaired. I didn’t actually get to see them because they were at the start of the race and I was WAY in the back, but I did pass a blind runner towards the end of the race. He had his assistant running beside him, leading the way and it was so inspiring to witness. Steven saw some of the visually impaired runners cross the finish line while he was waiting for me and was very inspired as well. After they began their race, the National Anthem was played and we were off. I had to start towards the back since I got there so late. MILES 1 – 5 – The first mile or so was pretty crowded. There was a lot of weaving around people. 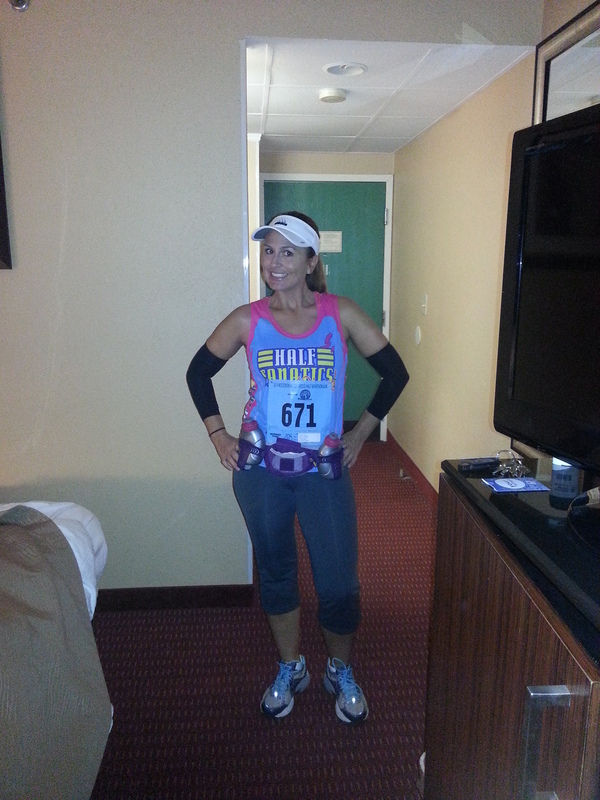 I was wearing my half fanatic shirt and saw 2 others early in the race who all said HI! The first 5 miles were great. I was feeling great mentally and physically. The course was ABSOLUTELY BEAUTIFUL!!! I had never run the George Washington Parkway before and the views of the Potomac just after sunrise were amazing. I considered stopping to take some pictures, but I didn’t want to hurt my time. 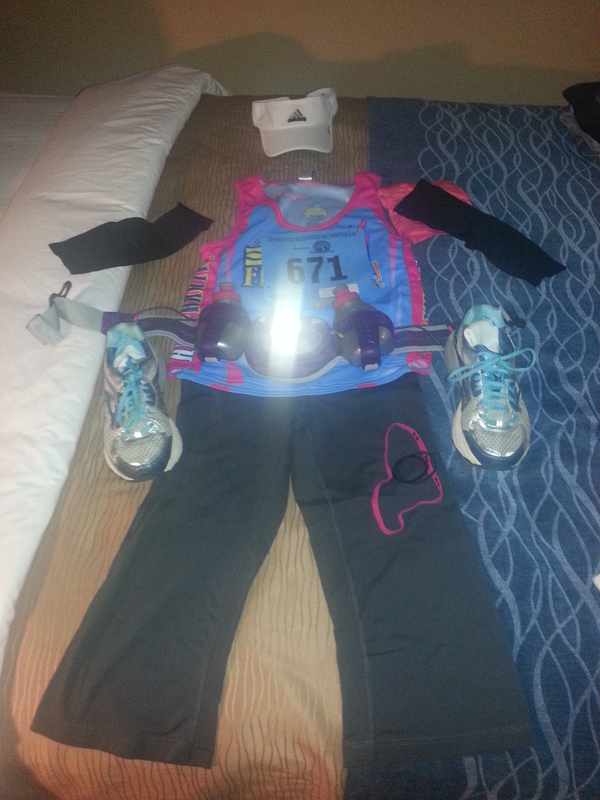 MILES 5 – 7.5 – Woo Hooo…I could see the mile 5 clock and timing mat!! ALMOST HALF WAY DONE! I slowed to a walk after passing the mile 5 timing mat so that I could eat my honey stinger waffle and drank some water as well. I didn’t let myself walk for too long though and was back to running pretty quickly. Up until mile 7.5, I felt okay. Not great, but not horrible. Physically, my legs were a little tired (no pain though), but the tougher part was mental. I felt like my lack of sleep was catching up to me. I decided to try to stick with the run until 7.5 and then I would take the Tylenol migraine I had packed for a bit of a caffeine boost. They also help with the soreness. MILES 7.5 – 10 – Without a doubt, the toughest miles of the race (mentally). This is where I really had to dig deep. I told myself I am an idiot for running when I could be in bed and that I am an idiot for even considering the idea of running a full marathon one day. I told myself that I should just call Steven and tell him I am walking the rest of the way. All these horrible thoughts were running through my mind. I thought that once I got to Old Town Alexandria and there was a change of scenery, I would be re-invigorated, but unfortunately, that didn’t happen. I tried to eat a shot blok around mile 9. I was unable to get it down and started gagging and had to spit it out (sorry to the people behind me). Of course, the first photographer I had seen was also at this point. I’m pretty sure he captured me spitting out my energy chews and walking. Nice. Why can’t the photographers be at the beginning of the race when everyone is feeling great?? When I noticed he was there, I picked it up to a run again and hoped that he at least got one of me actually running and not looking like I was about to fall over. I tried to focus on beautiful Old Town Alexandria, but I did continue to struggle. I was so happy to reach the turn-around point and head back towards the bridge. I finally saw the 10 mile clock and timing mat, which meant I was almost to the bridge!! 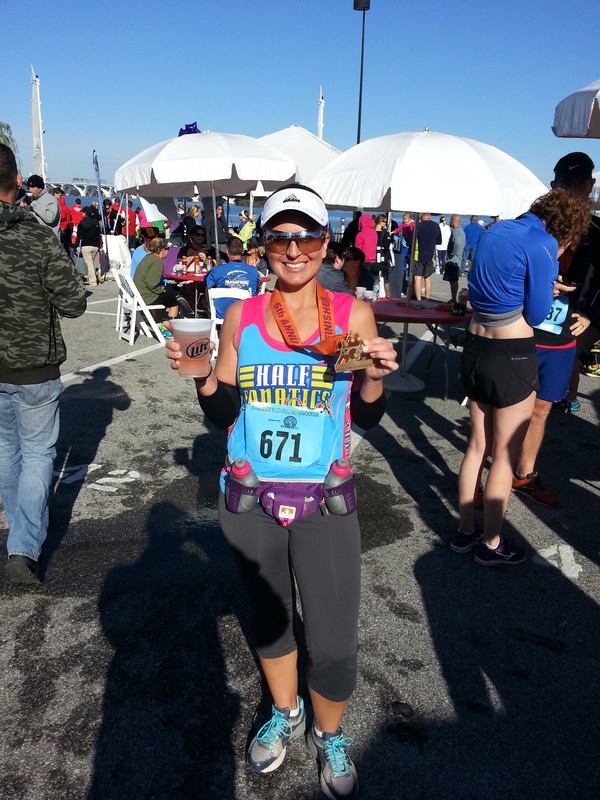 MILES 10 – 13.1 – Thankfully, I did feel re-invigorated when I passed the 10 mile timing mat. I can’t say I felt as great as I did in the beginning, but I felt better (mentally anyway). I headed for the bridge. It’s funny how flat the bridge looks from a distance…NOT THE CASE!! I did have to walk up parts of the hill on the bridge but tried to run as much as I could and walk fast whenever I couldn’t run. 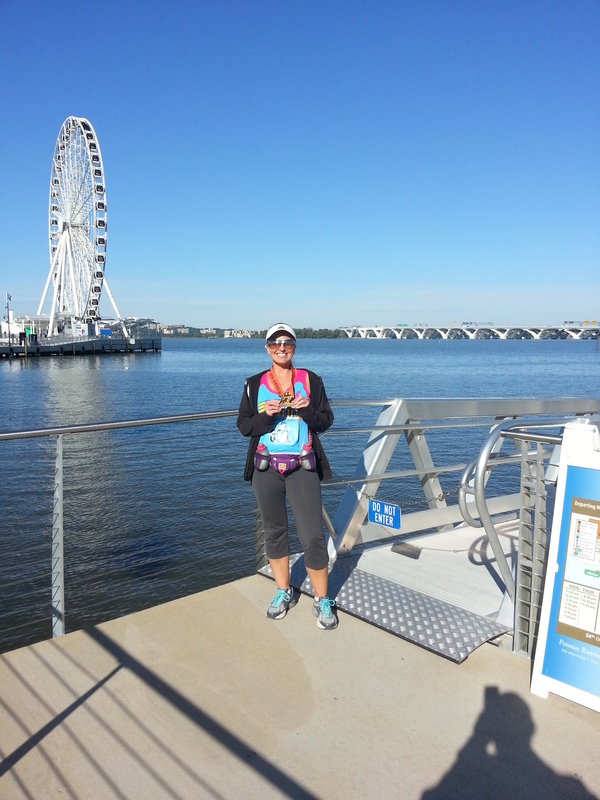 It was really cool to be running across the Woodrow Wilson Bridge. I have a lot of wonderful childhood memories of my grandparents’ house in Alexandria. These memories include crossing the WWB (with my Cherry Slurpee and sprees that we would always buy at 7-11 on the Maryland side of the bridge). The bridge meant we were almost to my grandparents’ house! My sister would always make us lock the doors of the white station wagon because she was terrified of the bridge (in hindsight…that probably wasn’t a wise decision – lol! Wouldn’t we want the door unlocked or windows down??). Of course, the bridge from my childhood is no longer there and this was a bigger and better bridge, but it felt just as nostalgic. The downhill part of the bridge felt great and I started thinking I might PR. I knew my GPS/Map My Run was a little off based on where the mile markers were, but I thought it *could* happen. When I reached the end of the bridge, I had to run up a steep ramp to cross over the bridge and down a ramp on the other side of the bridge. Of course, I started walking on the ramp and lo and behold, another photographer was there. I hope he didn’t get pictures of me walking. I quickly started running again and put on a fake smile for the camera. This is where it gets tricky because you feel like you are almost there, but the end seems to take FOREVER. 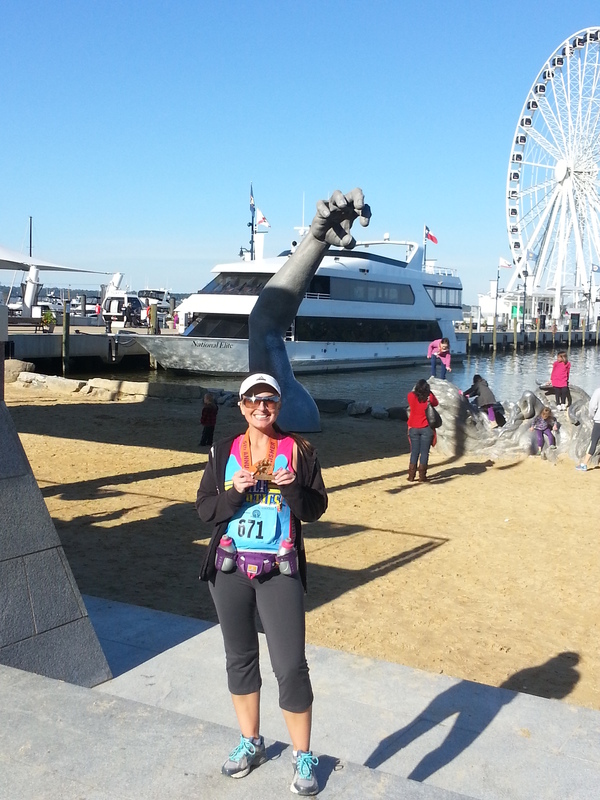 I ran the trail that leads to the National Harbor. I was struggling around mile 12.5. I felt like I should really kick it into high gear at that point, but I just couldn’t. I saw the 13 mile marker, but the finish line was still not in sight because you had to turn off again. I actually slowed down to begin walking at mile 13 (Cray cray), but a nice gentleman encouraged me to keep running…we were ALMOST THERE!! I finally saw Steven and more importantly (at that moment in my life), the FINISH LINE!! I was able to sprint to the end!! I did it!! Woot woot!! POST RACE – I thanked the nice man who had encouraged me at mile 13, got my medal, a gatorade, a water, and met up with Steven. We took some pictures and then headed over to get my free beer. I am not typically a beer drinker, but there is something about a post-race beer that just feels right. I wasn’t able to drink it all, but had a few sips. There was a band playing in the celebration village and they sounded pretty good but we decided we better get down the road. We picked up my jacket that I had checked at the beginning of the race (the volunteers were wonderful and this was a breeze) and we headed to The Awakening Statue to take a couple of pictures in front of that and in front of the Woodrow Wilson Bridge (Again…looking so flat in the picture). I highly recommend this race for anyone looking for a local-ish race. If it weren’t for the port-a-potty snafu, this race would have been absolutely perfect. We all received an apology about this issue so I don’t think it will be a problem in the future. Also, I would advise against staying at the Comfort Inn off of Oxon Hill Rd. You’re such a warrior. Awesome.